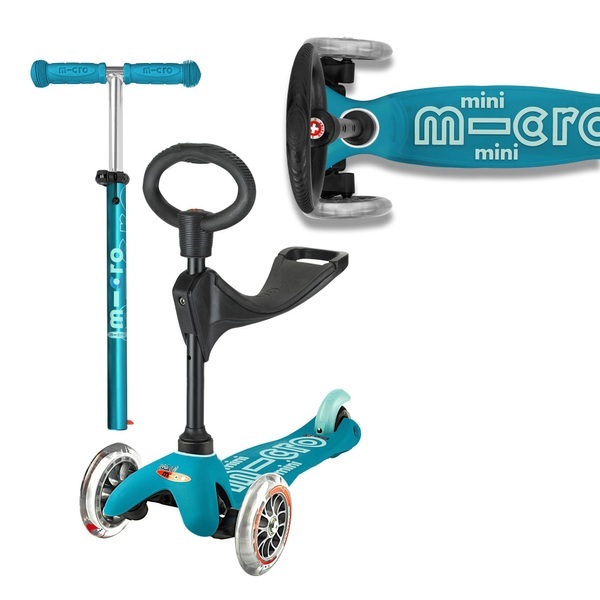 Hop on a deluxe ride on that grows into the perfect scooter: the Mini Micro 3-in-1 Deluxe Scooter! This robust and versatile scooter transforms from ride on to toddler scooter to three-wheeled deluxe Mini Micro, growing with your child from 12 months to 5 years. The Mini Micro 3-in-1 Deluxe Scooter begins life as a ride on for children aged 12 months. The sturdy height adjustable seat allows your toddler to get used to scooting and balancing. When your little one is confident on their feet, at around 18 months or 2 years, this clever scooter allows you to exchange the seat for a short and easy to grip O-shaped handlebar. The intuitive 'lean and steer' scooting style helps to develop balance and co-ordination. Even the slightest pressure on the brake will bring the scooter to a gentle halt, keeping your child safe as they scoot. The 3 non-marking wheels and sturdy deck provide stability, giving your child the confidence they need to master scooting. Once your child has found theirtride, the O-shaped handlebar can be swapped for an adjustable T-shaped handlebar, so you can continue to adapt the scooter to suit your growing child. The soft grips make the transition from O-shaped to T-shaped handlebar easy and comfortable. This deluxe model features an anodised stem to protect against wear and tear and a lightweight design that’s easy for kids to manoeuver. In the Mini Micro 3-in-1 Deluxe Scooter, Swiss design and engineering have produced a smooth-running, slick-looking, durable scooter that transforms quickly and easily from stage to stage. EU Warning: Protective equipment should be worn. Not to be used in traffic.